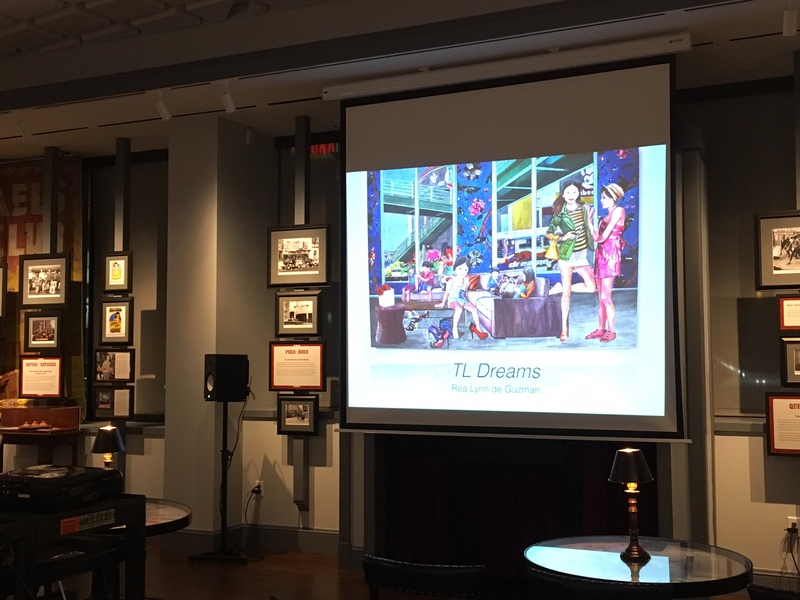 ‘TL Dreams’ – Exhibition and artist lecture | San Francisco, U.S.
Rea de Guzman gave a presentation of her artistic journey on the last day of the exhibition “TL DREAMS” at the 'Tenderloin Museum' in San Francisco. Paola Loomis reflects here on her inspiring story. During an artist’s lecture, both artists and community have the opportunity to engage in rich, revitalizing and insightful conversation. No matter if there is not a crowd waiting in line outside. Young devoted artists and their art can offer something that can be better savoured calmly. That is why we write about what made this exhibition and lecture so special for us. 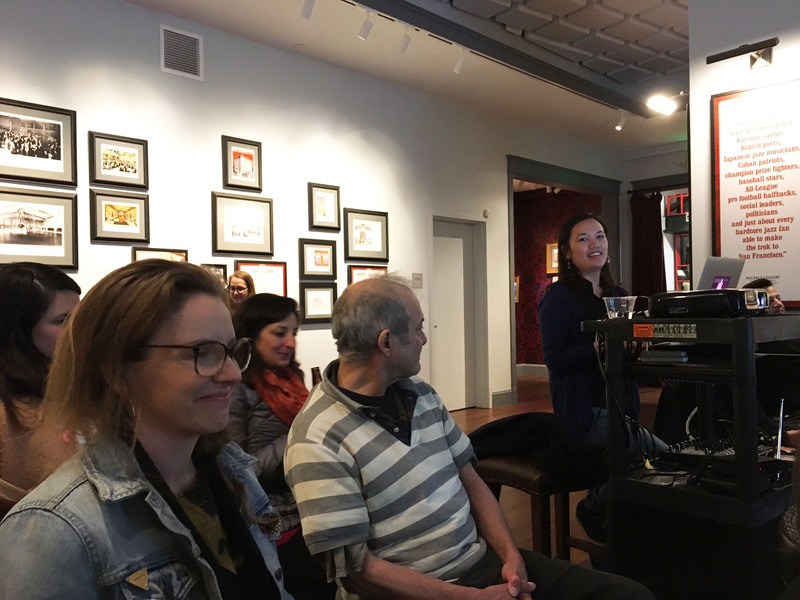 The “TL DREAMS” exhibition, by Rea de Guzman, had its closing reception on Feb 23rd at Tenderloin Museum in San Francisco, with the artist’s lecture open to the community. With her warm and gentle voice Rea de Guzman brought us back into her life, telling us about the challenges and experiences of a new life unfolding when she arrived here from the Philippines at age 14. She showed her artistic development and her affectionate bonds to the Tenderloin, the neighbourhood where she lived for her first five years just after her arrival to America. Her teenage years. 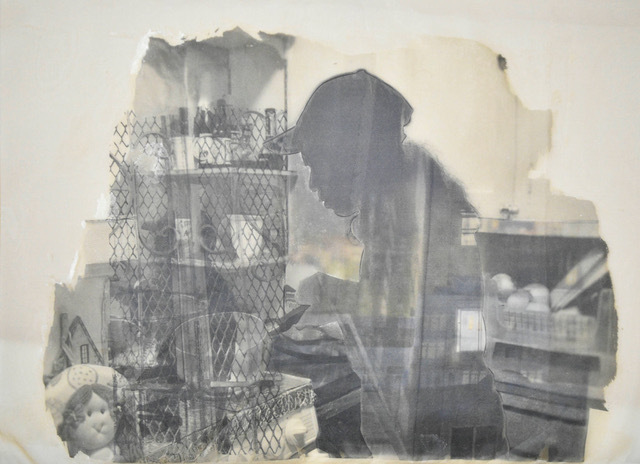 Now, 16 years later, Rea recalled some touching memories of the times spent with friends on the roof of her apartment building, viewing the city from above at night, when she was only a teen ager and didn't have any idea that she would become an artist. Up on the roof. Another perspective. A detached overview - that has many analogies with what we call visual art or imagination, as a different way to see reality - from where we can deal with the confusion of life, and soothe the harsh questions about belonging and identity. After 16 years, the view is again different, just as it was when looking to the city below. The old dreams, the new perspectives and possibilities, looking back and re-imagining the past, they were all confronting each others in the Rea's exhibition and during her lecture. A complex panorama in which people, stories, and art found a balance and nurtured each others. 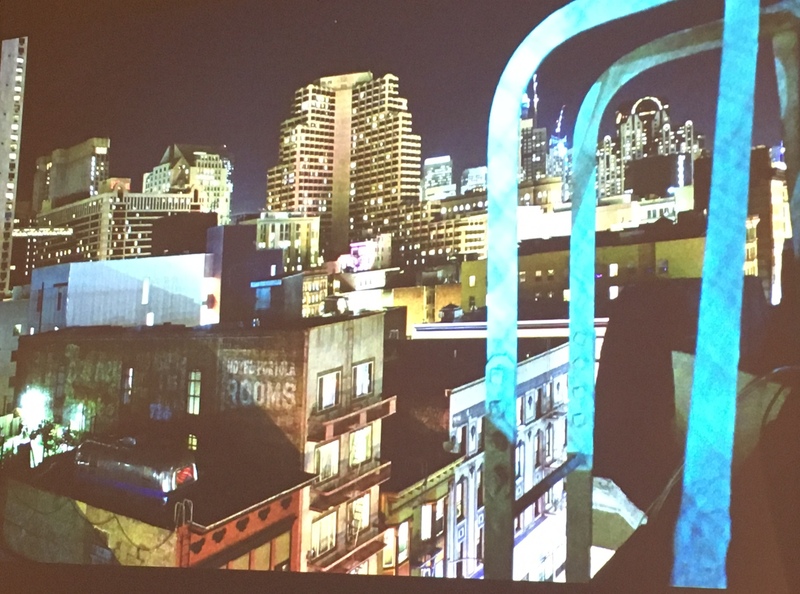 A third position, a liminal space, where recognition, reciprocity and respect, as well as the acknowledgment of the hard work behind the artistic and personal development, found their place, as it was among friends on the Tenderloin roofs, where the dreams began to be woven. 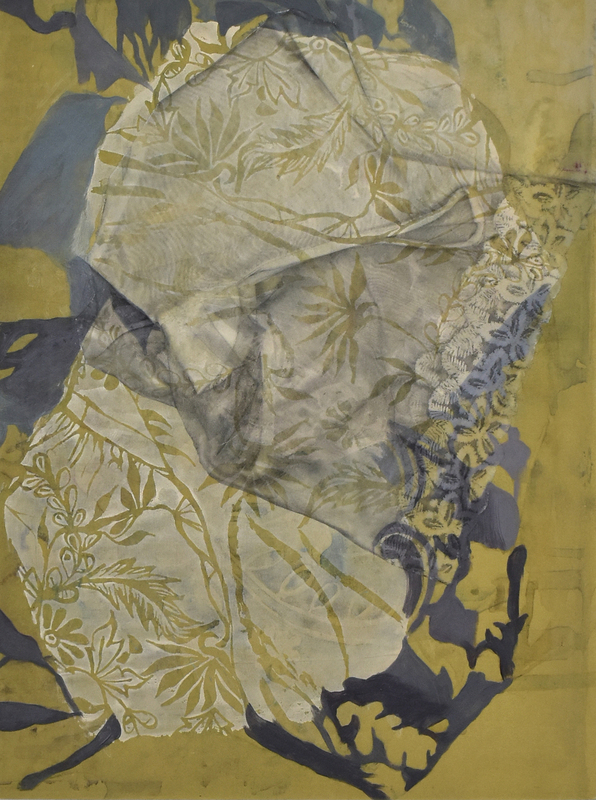 It is not by chance that the last series of Rea de Guzman's works are using organza, chosen by the artist as the support of image transfers. It is a fabric that perfectly perform the enticing interplay of revealing and veiling of dreams. The veil and the transfer, the layered surfaces and the ephemeral lightness of the support, make us enter in “such stuff as dreams are made of”, elusive narratives that do not spare sufferings and invite to thoughtfulness. Behind the choice of organza, there is Rea anthropological and historical research on “Maria Clara” mestiza dresses (see 'Fabric Fragments', and also her interview here). Her lecture showed how our structure of dreams and our imaginative tools can be strengthened in re-discovering and re-appropriating ancient techniques of weaving, such as that of using pineapple leaves, after scraping them to reveal the fibers. The story about the “mestiza” dress is itself interwoven in the complexity of the colonialist impositions on the native people. As Rea de Guzman pointed out, today a more subtle and yet similar imposition is straightway directed to the skin of young Filipino women (only them?) who “want” to look whiter. In a perspective in which visual art is a third dimension that helps us to see and understand the varieties and complexities of human cultures, art is indeed a vital tool, as well as dreams are. In a time when the strength of our dreams is belittled, the art practices that young artists choose for their projects, such as the processes of copies, replications, transfers, mutations, the rediscovering of old traditional techniques, studying quite forgotten native languages, and rethinking religious rituals and legends (all belonging to Rea's artistic engagement) are true sources of inspiration.